2. Realize you can't ignore it and actually go get them out of their cage because they are bored and want to play. 3. Play for a few minutes until they leave you to run around the office. 4. Check Facebook to see if anything happened since you went to bed. 5. Be disappointed because there is nothing new. 6. Go through Google Reader and wonder why Smashing Magazine did a post on the art of skateboards. 7. Decide they went there for cool factor. 8. Read all of the rest of the stuff in your RSS feed. 10. Do a blog post on the incredibly boring topic of being awake with gliders at 4AM. 11. Wonder why you are such a compulsive blogger. 12. Decide it doesn't matter. 14. Add the post to facebook in case someone's pets wake them up at 5am. 15. 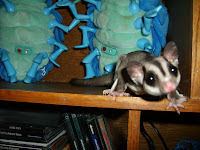 Find said gliders to put them back in their cage. 16. Go back to sleep.